and Fred Larson, Western Air Lines agent helping her down. Background -- Miss Marjie Millar [sic], Hollywood roommate of Miss Buehler. Boni is queen of Sunday Air Fair at International Airport. 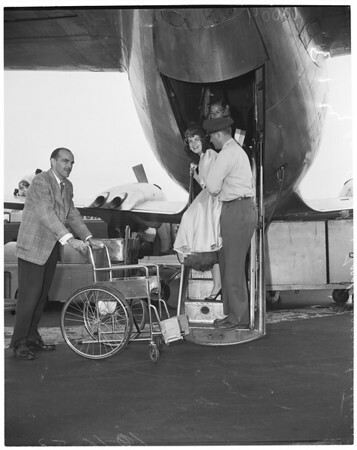 Boni Buehler, in wheelchair, with Geary Steffan, friend, and Nora Jerou, Western Airlines stewardess, also friend. Bonnie Buehler in wheelchair."